Yesterday evening, with the help of Sam Sabey, I was able to have my SEGmeter set up to monitor my electricity usage for my home. This is a very exciting development for me, as it’s something I’ve been trying to hook up for a while. This now means that I (and you!) 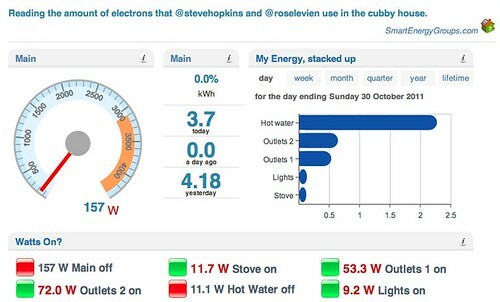 can see how much electricity Rose and I are using in our studio apartment, the Cubby House. To see how much energy we’re using, in real time, check out this page. You can see an image of our dashboard below. So what is it? Here’s a few thoughts. 1) People have talked about having smart meters in their homes for quite a while. By itself, it’s not a new idea. All the energy companies have probably, at one time or another, made the attempt to implement smart meters in the home. In fact, Energy Australia is rolling out smart meters to businesses over the next decade. .
2) However, these aren’t open source or, perhaps more accurately, user based activities. With Smart Energy Groups, Sam has created an open source and diligent community of people who care about monitoring their energy use. The organisational fulled smart meters, such as those talked about above, are much more expensive to make and install. My SEGmeter didn’t cost me much, and is something I have full control over. I can tweak it, connect to it via API, and generally modify my use of the segmeter to provide me with the information I need to make better decisions about my energy use. 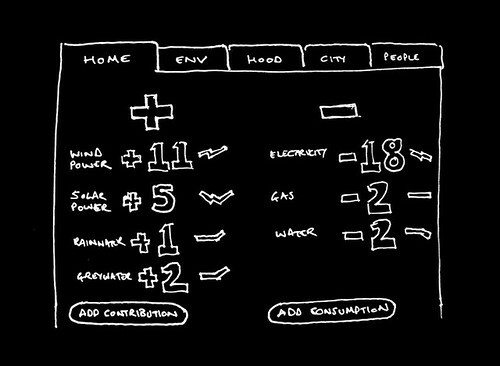 3) Dan Hill wrote a fantastic blog post years ago in 2008 titled, ‘The personal we.’ In that post, I remember getting really excited by Dan’s insights and thoughts on what could become a community based, energy saving game. Specifically, I remember seeing a sketch he had made of what the games score board could look like. You’ll notice it actually looks remarkably similar to what Sam’s SEGmeter dashboards have become. 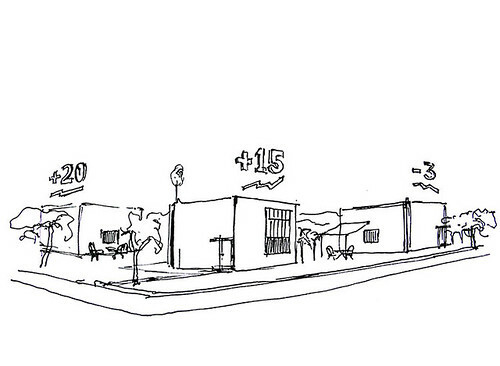 He also drew up another fantastic sketch of houses in a neighborhood with a score hovering above them. I’m excited because having the SEGmeter installed in our home now means we can participate in this game which seemed so far away in 2008 when I read that post. That’s amazing. Energy is one of those things which is not going to go away for the human race. Energy makes an impact on each of us, in every minute, of every day. It’s something that’s unique in our world, as it’s a concept that everyone understands. People living in the darkest corners of Sudan, DRC or Zimbabwe understand as intuitively as those of us living in Sydney, London or New York the importance of having energy available to do what needs to be done. We’re at the very beginning of understanding the true impact that energy has on us as a global population, and having things like the SEGmeter exist means we can begin to get a feel for what that is through data. What an exciting time to be alive!